From the day I became one of the best spriters in Mugen world, many of you have pointed out to me that I am very fast. Well ... I think it's time to reveal my secret to you. This is a particular and original method that I invented many years ago. 1) Choose any graphics program you have. I recommend strongly GraphicsGale. 2) The first thing I do, is to open a new window. A very long window. I personally choose a length of 3000 pixels. 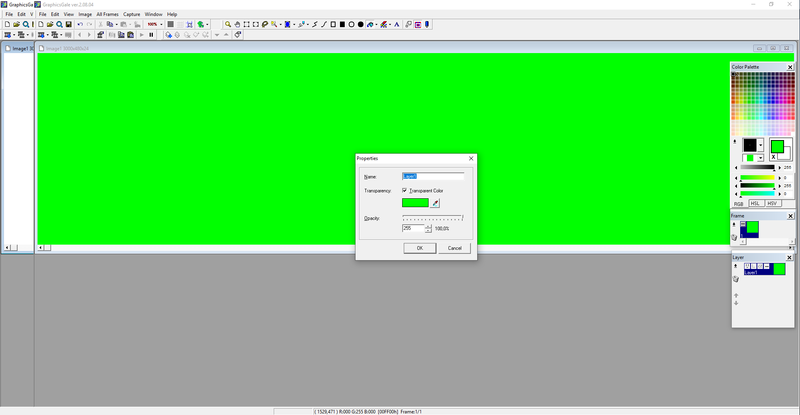 3) Then I choose the transparent color (whatever, but I prefer the green), and then I add layers. I much prefer to duplicate the main one, so I do not have to set the transparent color again. 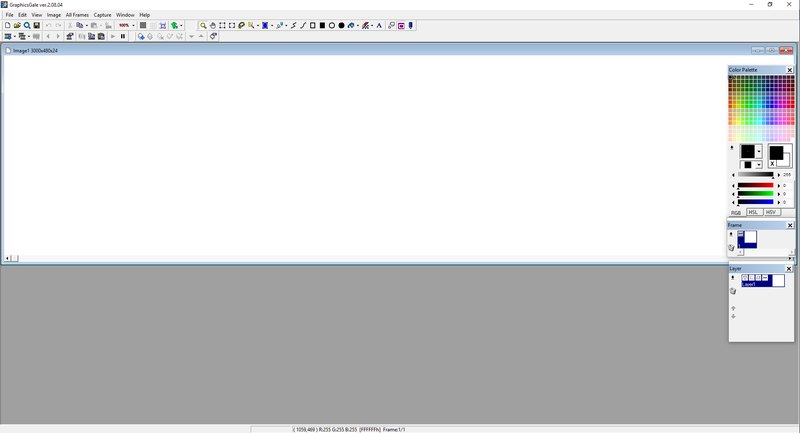 4) Now I access the properties of the first layer and I decrease the opacity. 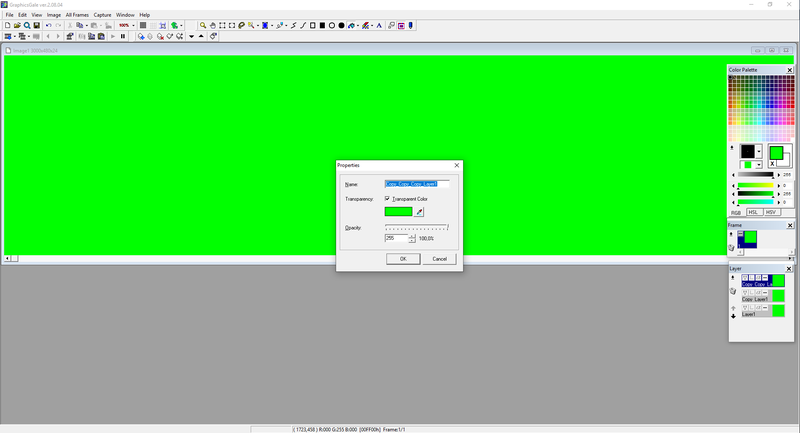 The green background will still be there, but it will become invisible. 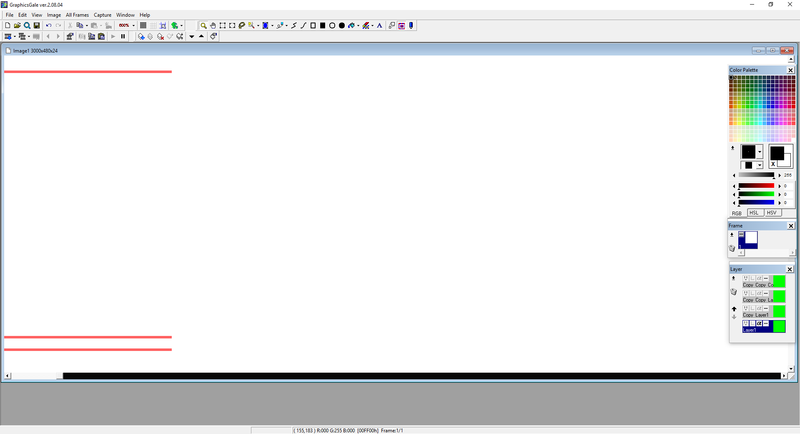 5) At this point, you have to zoom in and create lines that determine the proportions of the sprites. 6) Now you have to zoom in as many times as your eye is able to analyze the pixels to draw the sprites. 7) Now begins the most difficult part to explain, because the scroll bar will enter the scene (I have selected it with an orange box). 9) If you have the proportion lines still copied, you simply need to paste and move the pasted image with the arrow keys, then move it and click various times on scroll bar until the selection is aligned. 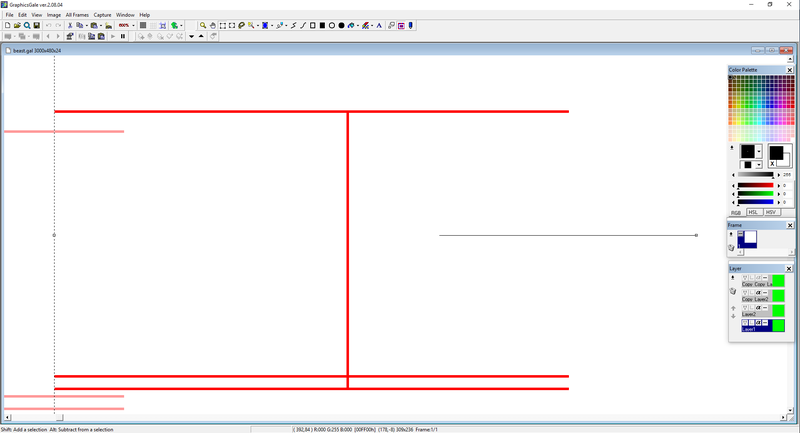 10) Now you have to paste the proportion lines along the entire length of the window. We got a sort of "timeline" for sprite animation. 11) Now, you just have to sprite, but since this is an example, we'll use Beast sprite made by me and Motorroach. Under the beast sprite I added a kind of red cross: that cross is adjacent to the proportion lines. 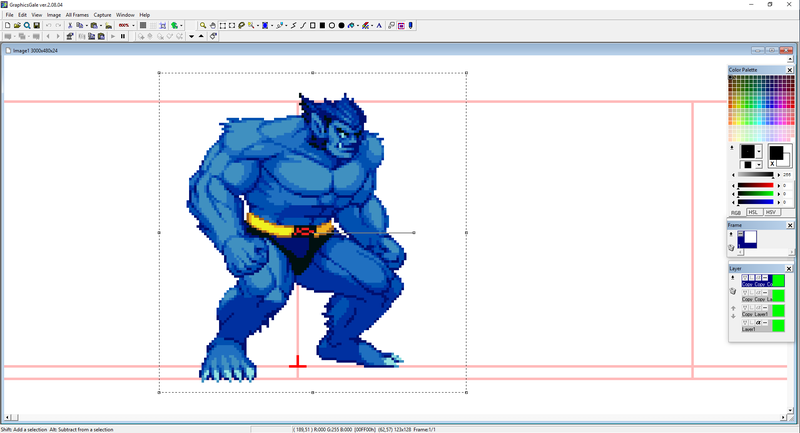 12) Click on the scrollbar and paste the beast sprites so that the red cross rests on the proportion lines. Obviously, this must be done with the zoom. If the zoom, the proportion lines and the sprites are well aligned, when you press the scroll bar the animation (if so we can call it) will be static. If it is static, it means that we have done well. And you've done it. You have created a sprite animation in a very simple way. FINAL WARNING: Don't change the length of the window by clicking on the border at the left and at the right, or the "timeline" would mess up. I hope this tutorial can be of much help to aspiring spriters. Cool! 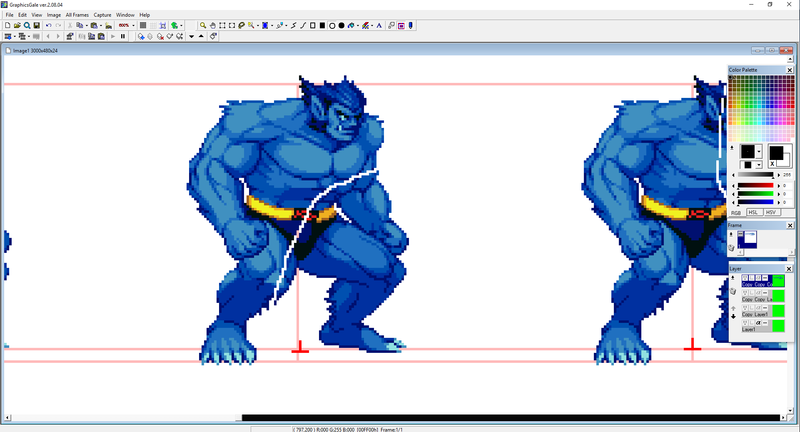 I always wondered how people animated sprites by cutting odd shapes and duplicating and filling in changes. Thanks dude. Thanks for the insight on your excellent spriting, Gladiacloud. 1.) Regarding your pictures, you basically work in the upmost layer, including the alignment cross / separation frames, etc. Do you clean these out by hand, when happy with the result? Wouldn't it be easier to use another layer for those & just set it to invisible when done? Also, why paste these on in fragments, instead of drawing the proportion lines through the whole 3k pixels? I never used GraphicsGale, so please excuse if this due to GG. 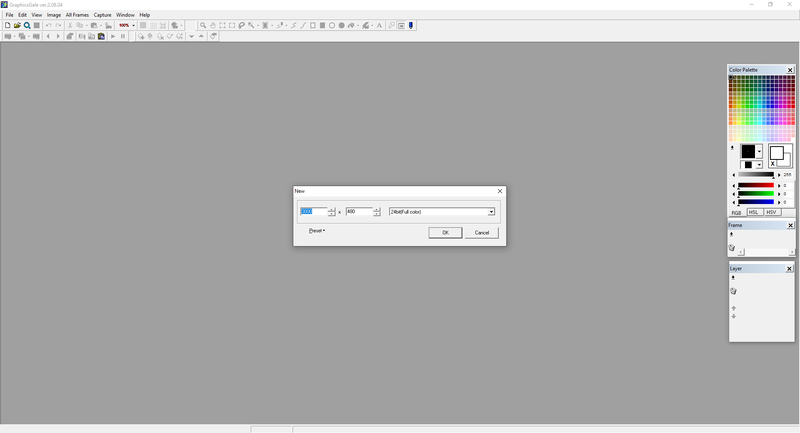 Gimp allows to draw a straight line by holding SHIFT, same goes for moving stuff. There SHIFT freezes one axis. 2.) I'm well aware that you went easy on us, but what's the fourth layer for (actually the third for you)? Maybe you use it to fix gaps you produce when moving parts of the sprite, without directly painting into the sprite? You might have already figured... I sometimes fail counting... Sorry! Thank you for this out of the sudden! I remeber that back then, gfx gale would choke on me if I create an image that big; but nowadays I have 32 times more ram. my method is (was?) similar to that one, except that I woudl use gfx gale's multiple frames/animation options, as the biggest reason I choose gale over other spriting software was that gale was oneof the two native windows apps that had layered animations. A nicer answer asking to elaborate on what he did not understand would be good; but just posting "what" comes out as pretty rude, yeah. Yeah I wasn't sure what the point of that post, if its asking for clarification they should just take the extra 2 seconds to clarify that. You may be right. Sorry about that, I didn't understand it first and I thought it was a weird "joke" post. 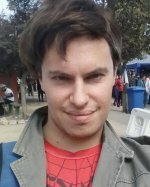 It's very cool, many guys have interest to learn new techniques for improving their skills. I hope give a MVC treatment for unknown soldier, I really wish make him a good char. i'd like you had put the name of each tool you used at this tutorial, however you taught the step by step, it´s missing the explanation about each tool icons. sorry! my lack of skills, but this editing software is new for me. the tutorial is good, but you could to have shown the result. 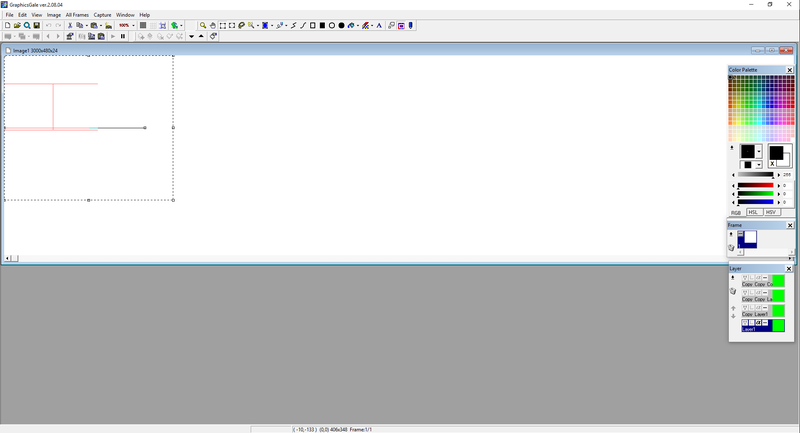 My tutorial is not about spriting, but about my personal method of spriting animation. 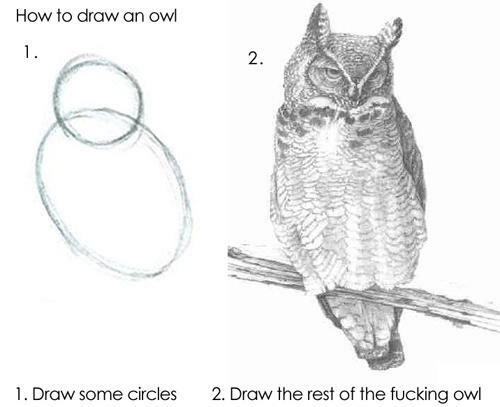 Unfortunately there will never be a precise tutorial on how to draw sprites. The existing tutorials give only some advice, the spriting itself is something that you learn over time. I'm not sure to understand why?? It's just to make the sprites different, since they are all the same in every "frame". When you press the scroll bar, the sprite seems to be animated. Just one question: How is it better than just using the animation feature in GraphicsGale? That way you don't have to do a timeline. STAND ANIMATION created with Graphicsgale using a unique sprite with the tutorial of gladiacloud. Really so fast.... i don't believe when i saw the animation working in few minutes and easier than before. with the same standard and easier animates other areas showing the immediately result. 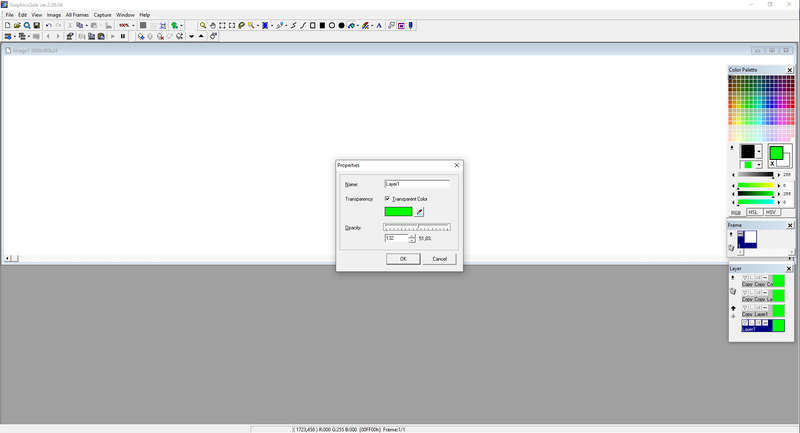 the preview window show us how it´s looking and amplying the image it´s possible to see the errors and revamping them. LASSO = selects specific areas of sprite to make alterations that you need... example move a little parts without interfere at rest. RECTANGULAR SELECTION - amazing tool!!! 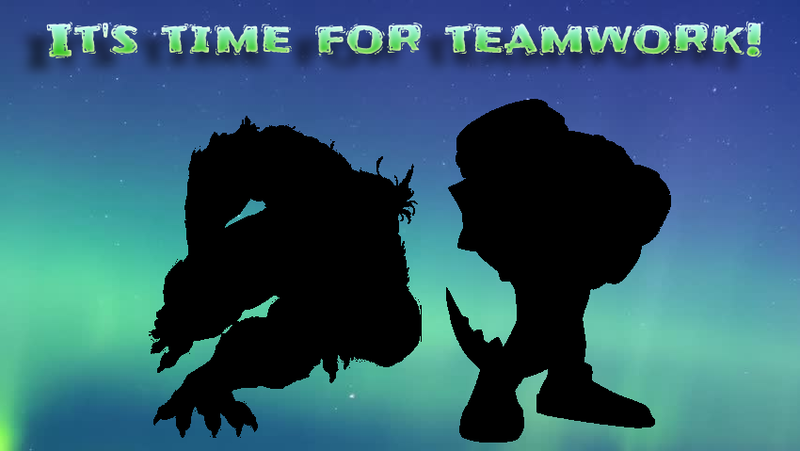 with this you select any part of char and can rotate it to build a new position. PEN = used for you rebuild alterated parts on char, it´s possible with right button of mouse picks the exact color to rebuild missing parts of new sprite. 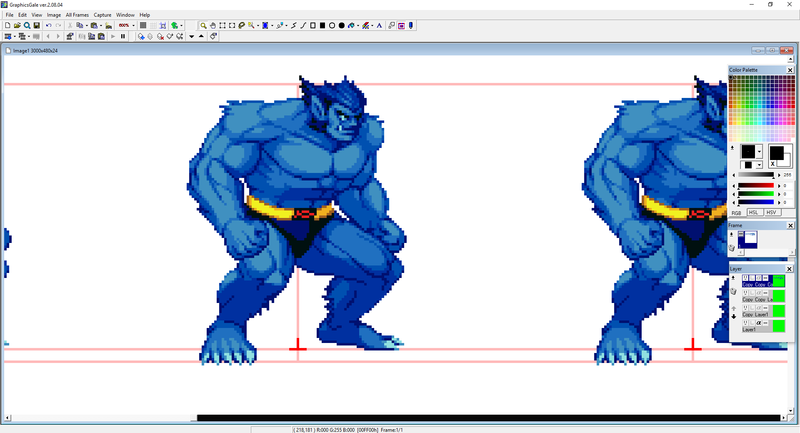 DUPLICATE = duplicates the sprite for you build a new to animation. PREVIEW = shows the immediate result. Last Edit: March 07, 2019, 08:38:29 am by Mazemerald. Oh, I see, so it's not really randomly. It's more like to recreate some breath or something.